A' Design Award and Competitions are pleased to announce that the work Jordan Apotheke by Conceptlicht Gmbh has been granted the notable Golden A' Design Award in Lighting Products and Lighting Projects Design Category. 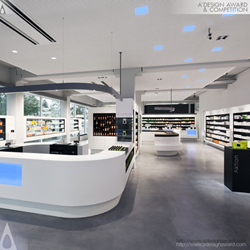 A' Design Award and Competitions are proud to announce that the work Jordan Apotheke by Conceptlicht GmbH became winner of the notable Golden A' Design Award in Lighting Products and Lighting Projects Design Category chosen as one of the winners by the international referees of the A' Design Award & Competition within numerous nominations. Supporting the expressive architecture of the pharmacy interior, the functional luminaires are unobtrusive in their appearance, drawing attention to their effect of light instead of their fixture design. The luminaires for basic lighting are either integrated in pendant luminaires tracing the shape of the furniture or are mounted at the sides of the suspended ceiling, keeping it as free from down-lights as possible. Thus, the users can focus on the track of light leading through the pharmacy, consisting of RGB-LED-backlit tiles that match the color of the likewise dynamically back-lit counters. The Golden A' Design Award is a prestigious award given to top 3% percentile designs that has delivered an exemplary level of quality in design. The designs are judged by a panel of three different jury which is composed of Academic, Professional and Focus Group Members. The designs are evaluated with score normalization to remove any biases and are voted on aspects such as functionality, ergonomics, engineering, presentation, innovation, usability, fun details, technology, and any other specific points that could be considered, each of these points are further weighted for different jury groups.